Anyone who’s ever spoken to me about authors knows that the author I loathe most is Tolkein. I hate Tolkein’s work because I can’t understand how someone who fails entirely to grasp the idea of interworking exposition with climax can sell a single book! These people may also realise that I have a double standard insofar as my hatred of Tolkein for this reason has not caused me to dismiss the playwrights of Ancient Greece. The fact is, the Ancients wrote for a different purpose and a different audience, but Tolkein was just a babbling fool. Aeschylus, of course, was a master playwright, who had a justifiable reason to write an enormous quantity of vaguely interesting, but largely confusing, expository matter and interspersing it between some good dialogue and interesting plot. What I like most about Rachel Hogan’s adaptation of Agamemnon is that she has managed to distil the essence of Aeschylus’ tale into a performance that is widely accessible. In doing this, the focus is drawn carefully onto Agamemnon’s wife Clytemnestra, particularly her interpretation of Agamemnon’s actions, and her primal response to his slaughter of their child. These characters are portrayed exquisitely by the performers in this production, who balance the intensity of their emotions well with the need to edify the audience, as was the tradition of the Ancients. The interplay between what we can control and what we can’t control is one of the things we humans find most difficult to get a grip on. For the most part, we get the things we can control confused with the things we can’t; and even when we do know which one is which, we still instinctively try to control the things we can’t, ignoring the things we can. In some ways, Agamemnon’s story is that of a king who spent ten years doing something about what was out of his control, while unwittingly losing his grip on what he could have had. 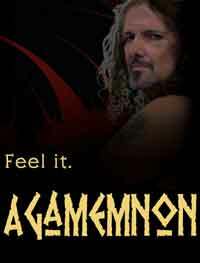 But then again, Agamemnon was never really about Agamemnon. Although I may have retitled it Clytemnestra, I love what Rachel Hogan has done with Aeschylus’ play, perhaps enough to hail her as the anti-Tolkein. Of course, she may take offence at that (I don’t know how she feels about Tolkein) but it is intended to be the compliment of compliments!